Reading Books is believed as a good habit. eBooks make this more easy to buy and read books anytime and anywhere with your digital device. The eBook market grew a lot in the recent 10 years, and now there are many good platforms to buy and read ebooks and audio-books. Google Play Books is such a platform, where you can buy and read eBooks and Audio Books. Google Play Books is an eBook platform owned by Google. Started in December 2010 as Google eBooks. Here you can purchase and read eBooks and audio-books on cross platforms, Android, iOS, Chrome Extension. It synchronizes your downloaded books and your progress across your devices. So you can start reading any book in one device and can end it in another device. 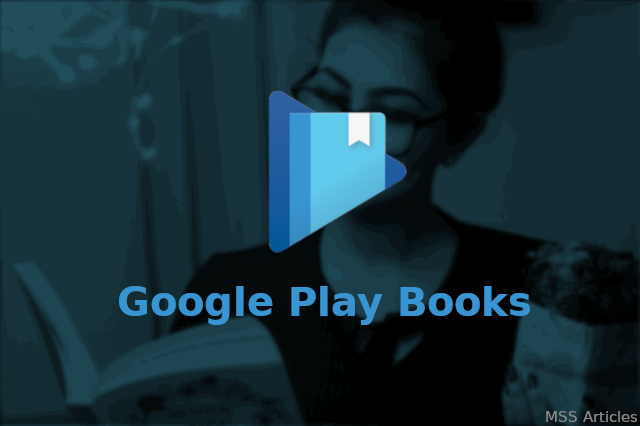 Now let's review Google Play Books with three basic needs of an eBook application, which are: the Reader, Library and the Store. 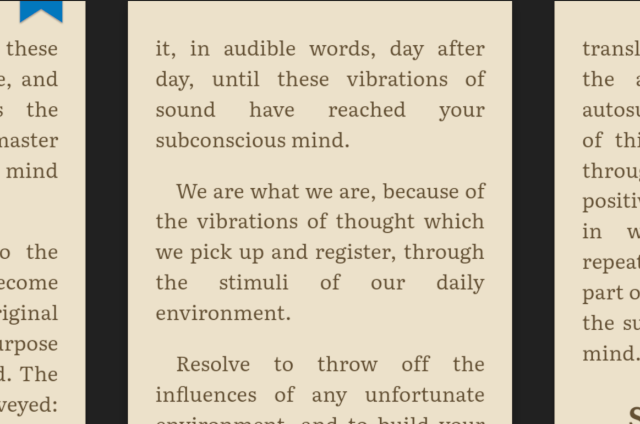 Reading experience in Google Play Books is quite impressive. It has all the features of a good eBook Reader along with 3D page turn animation which makes it more interesting. It has three colour options: black text on white background, white text on a black background and brown text on the sepia background. Along with automatic night light which if turned on, filter blue light automatically as per the time. This works on the Sun Rise and Sun Set timing. But it has nothing to do with an available room light. You can adjust the text size and spacing between lines to get a better reading experience. Five fonts are available from which you can choose the one which you're like. You can bookmark any page by clicking once in the top right corner of the page. When you click on the middle of the page, then you will see a slider, which allows you to slide between all the pages of the book, and can access your bookmarked page and the current page with just one click. When you click and hold on any word on the page, then you will get the meaning of that word from the dictionary and location if it is a place. Translation in other language is easy with the inbuilt Google Translate. You can also add comments or highlight any phrase with available 4 colours. There are also options to copy or search within the app. Library in Google Play Books is quite simple but not so effective as compared to other applications. Although it has basic facilities available in it. Your books are organized into three categories, Start, Continue and Completed. As the name suggests, the books which you have not started are there in the Start section, the books which you are reading are in the Continue section and all the books which you have completed are there in the Completed the section. There is no option to add tags to books or to organize in your own way. You can sort the books in alphabetic order with respect to Title and Author or by Time. There is an option to search your books by the Title or the Author in Library. Other than eBooks from Google Play, you can also upload your own eBook or documents on Google Play Books which will be synchronized across your devices. The Book Store of Google Play Books comes with the power of Google. Being the best Search Engine till date, you can easily search any book on Google Play Books or in the Books section on Google Play Store. Books are well organized in different categories and sub-categories. So you can get your dream book easily. 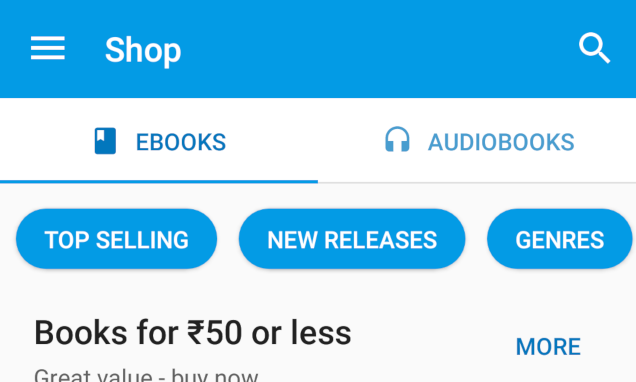 You can also add books to your wishlist as you can do for any app in the play store. You can use your Google Play Rewards for any service of Google Play. So you can use those rewards to buy books also. Although book prices on the Google Play Store are slightly higher than other eBook Store. Smooth reading experience with 3D effect, bookmark, highlight features. Inbuilt dictionary and translation tool (Google Translate). Well managed eBook Store within the Play Store. Easy to change colour themes, font size, font style and spacing between lines. An eBook can be downloaded in desktop in EPub format, which can be read by any other software also. Dictionary doesn't work perfectly in offline mode. Sometimes you have to wait for the dictionary to appear. There is no option to add tags to books in the library. Book prices are slightly higher than other platforms. Reading Experience: 5 / 5. Overall Rating for Google Play Books: 4.3 / 5. Google Play Books is a nice application to buy and read eBooks and audio-books. The reading experience is very nice but there is more to improve in the library section and if the prices of books could be reduced then this app can be the best ebook platform. Although Google is regularly updating this app from 2010, now it may fix these problems in the next updates. What are your reviews for Google Play Books? Let me know in the comment box.